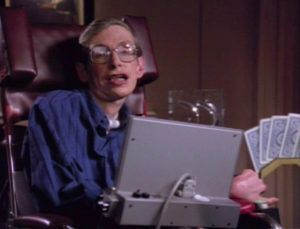 I suppose I could cite the Star Trek connection: PROFESSOR STEPHEN WILLIAM HAWKING was the only person to ever play himself on an episode of any Star Trek series when he appeared in a Holodeck simulation at the beginning of TNG‘s “Descent, Part 1” in 1993. But I would have dimmed the lights of Fan Film Factor regardless of Hawking’s appearance on Trek because…well…because we was Stephen Frickin’ Hawking, dammit! He was cool. He was a rock star. He was almost impossible. What I mean by that is Stephen Hawking should never have happened. His disease—amyotrophic lateral sclerosis (ALS)—is a cruel killer. It takes away your body while it leaves your mind trapped inside. By all predictions of his doctors back in 1963 when he was first diagnosed, Hawking’s expected lifespan was optimistically two years. By all rights, Stephen Hawking should have been long dead before the first episode of Star Trek ever aired in 1966. But as we all know, that never happened. Hawking made science and nerdiness seem somehow cool…which was really odd, if you think about it. Even without the wheelchair and the debilitating motor neurone disease, Hawking still looked like a complete Poindexter…the kind of guy who would have his lunch money taken on a regular basis by bullies who would leave his underwear stretched up to his shoulders. Add in the monotone computer-synthesized voice, and this guy was sure to be picked on relentlessly by the knuckle-draggers of the world.